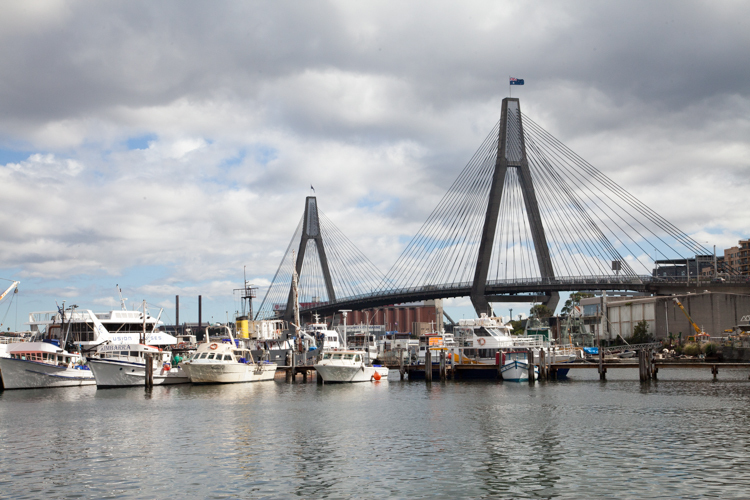 Pyrmont Archives - Adventure, baby! 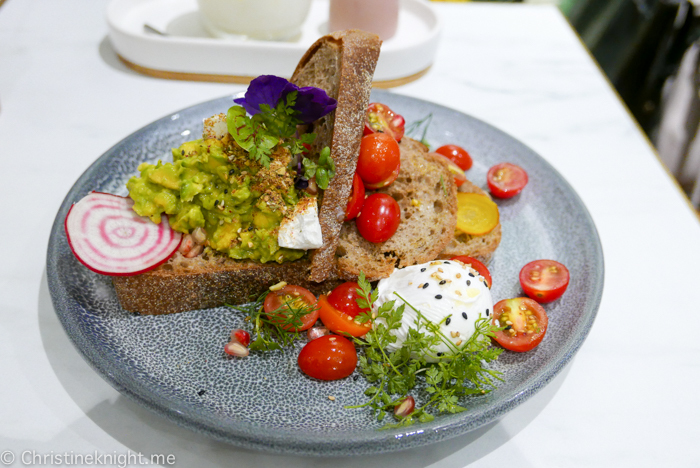 Two Sis & Co. Pyrmont is a bright cafe on busy Harris Street serving up all-day breakfast, delicious lunch and colorful creations. We visited on a rainy Sunday and were surprised to see that even on a day when the rain was coming down like cats and dogs that the cafe was packed and there was a wait for tables. 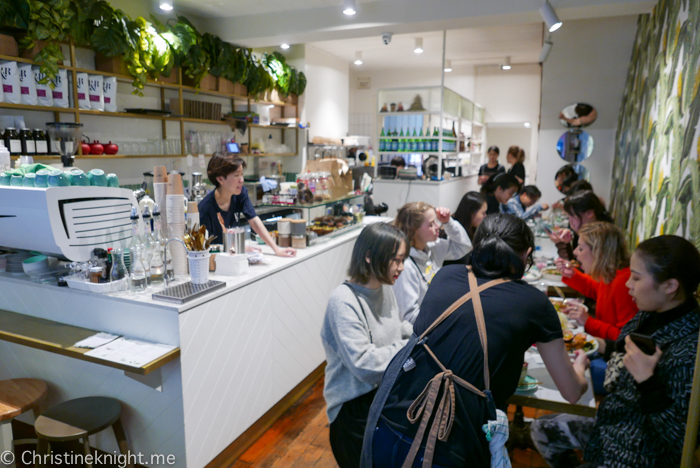 The cafe is quite small, with not many tables and only three tiny outdoor tables. 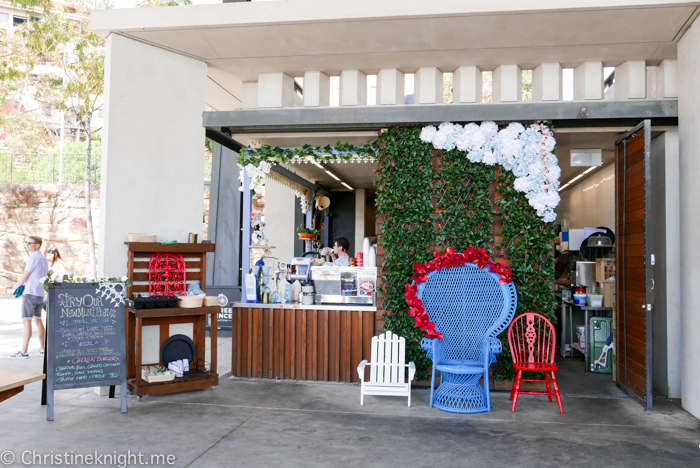 Dining here with little or multiple kids would be a challenge due to the size of the cafe which would not be able to accommodate strollers, plus there is only one high chair on offer to patrons. The staff are extremely friendly and the service is fast and faultless. Considering how busy the cafe is and how small the kitchen, we were amazed with how fast the food arrived. 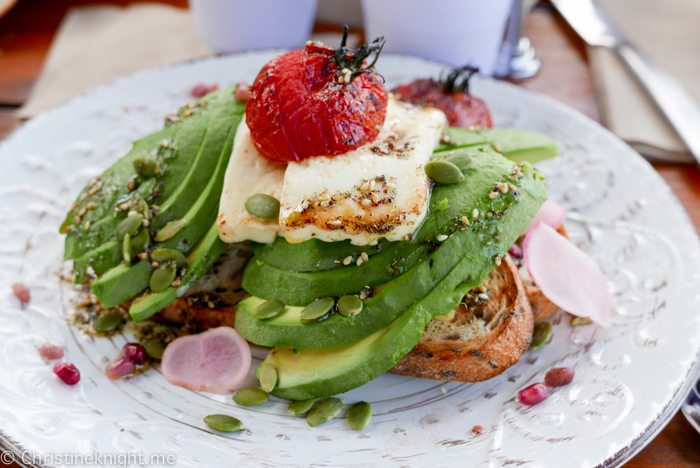 We ordered their signature Mermaid pancakes (mermaid tail, whipped mascarpone, chocolate rocks, fresh raspberries, dragon fruit balls & peanut butter sauce, $23.50), Our Pick Smashed Avocado (medley tomatoes, Danish feta, dukkah with sourdough $15.50, plus poached egg $2.50), Free Range Eggs Any Style On Toast ($9.50) plus Side of Avocado ($3.50), Dukkah Eggs (smashed avocado, poached eggs, lemon dukkah, balsamic glaze $18, with roasted mushroom, crispy bacon or cured salmon, $18.90), Iced Rose Latte ($7.90). 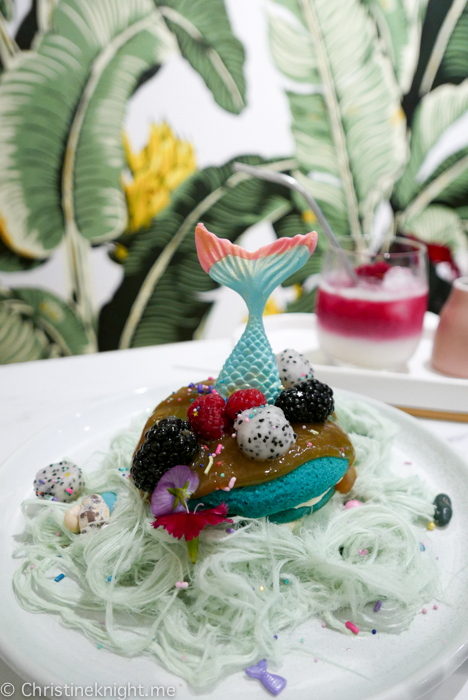 The Mermaid Pancakes were quite a surprise. 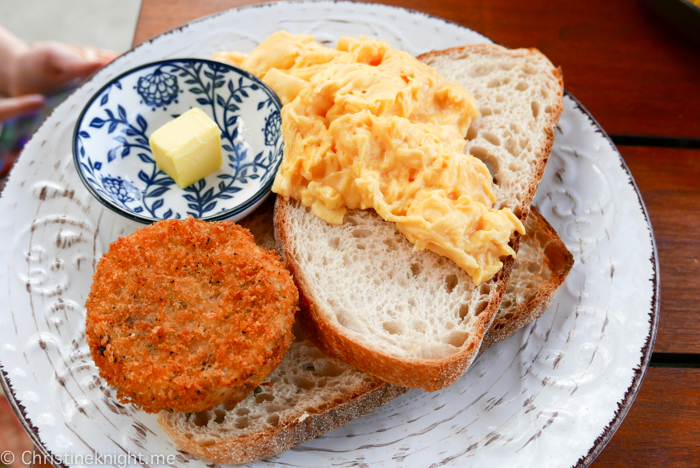 The actual pancakes themselves were not sweet in the slightest – Cheese thought they tasted like blueberry. 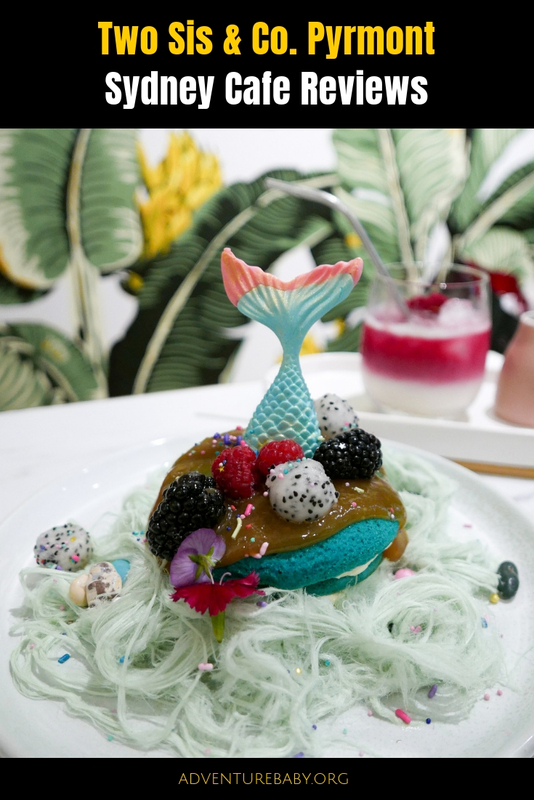 The whipped mascarpone added a bit of sweetness but not overwhelmingly so, which was great because there was a lot of fairy floss and chocolate rocks to go with them. The only element we didn’t love was the peanut butter jelly / syrup. Even though I love peanut butter I wasn’t a fan. I would have preferred Nutella! 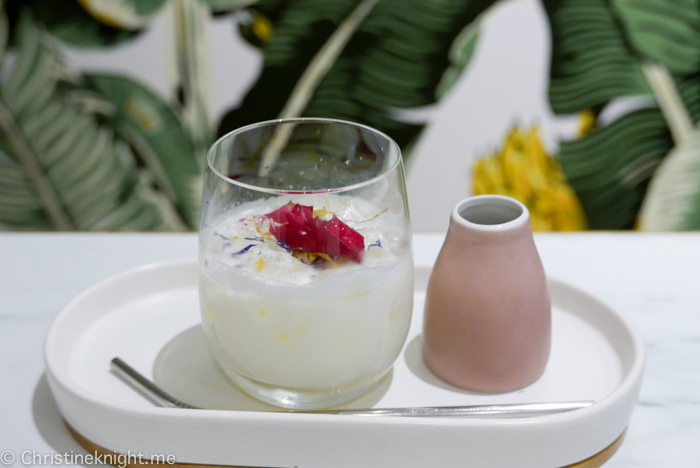 The Ice Rose Latte was divine – not only theatrical and gorgeous, it tasted like the most amazing rose in a glass. 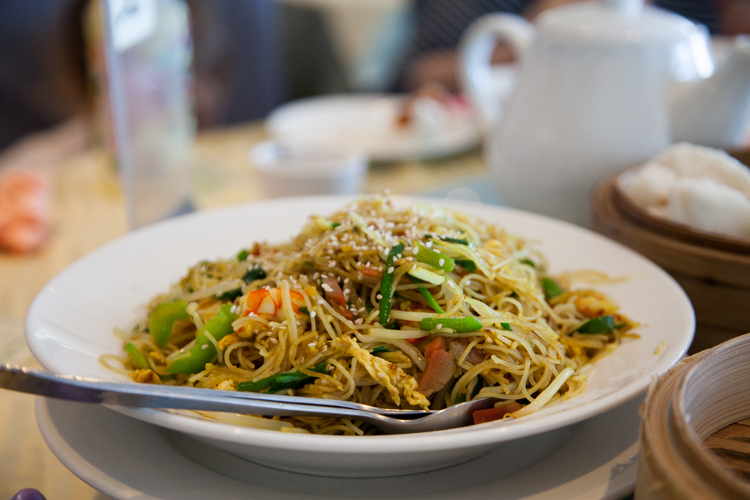 Delicious and beautiful. The food was not just well presented, it also tasted amazing. Really good serving sizes and beautifully presented. 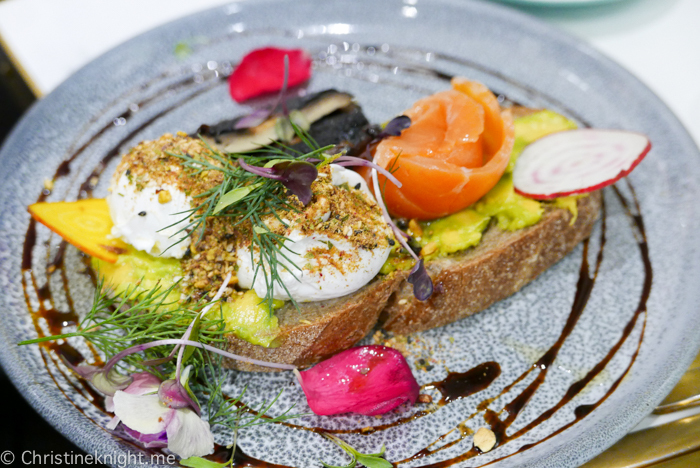 A gem of a cafe in Pyrmont that is highly instagrammable but just as delicious. 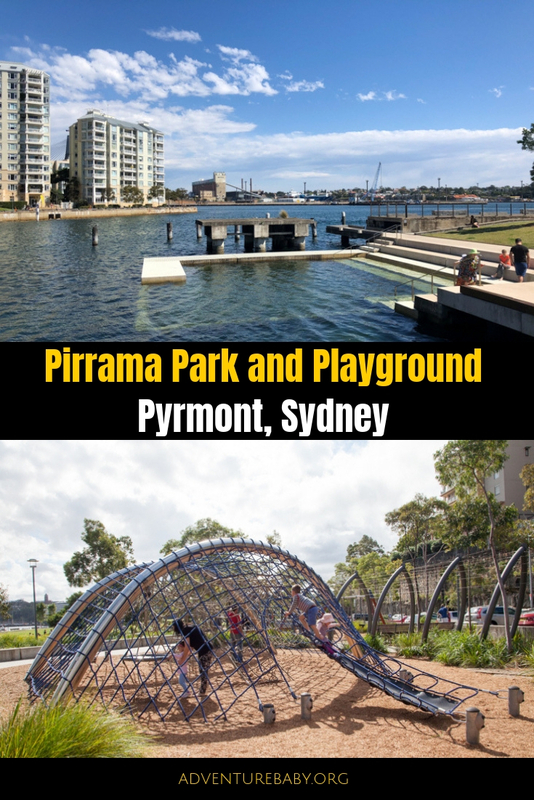 Pirrama Park is a beautifully landscaped harbour front recreational area in Pyrmont, Sydney. 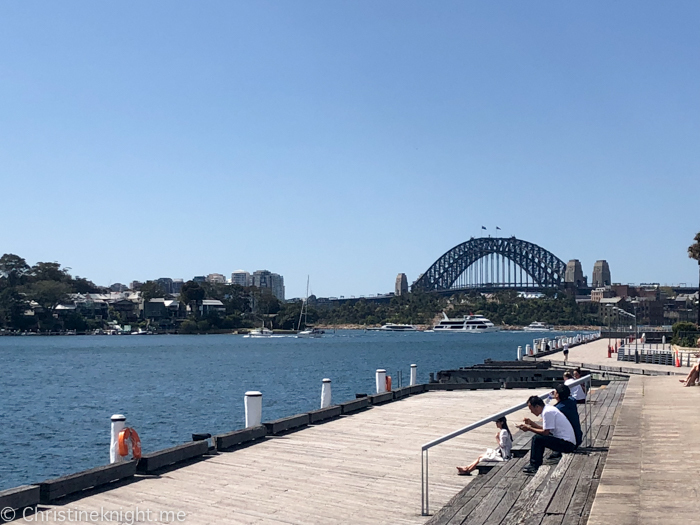 With grasslands, a playground, cafe, public bathrooms, sheltered bay for swimming and wide avenues, it’s the perfect spot for a family gathering. 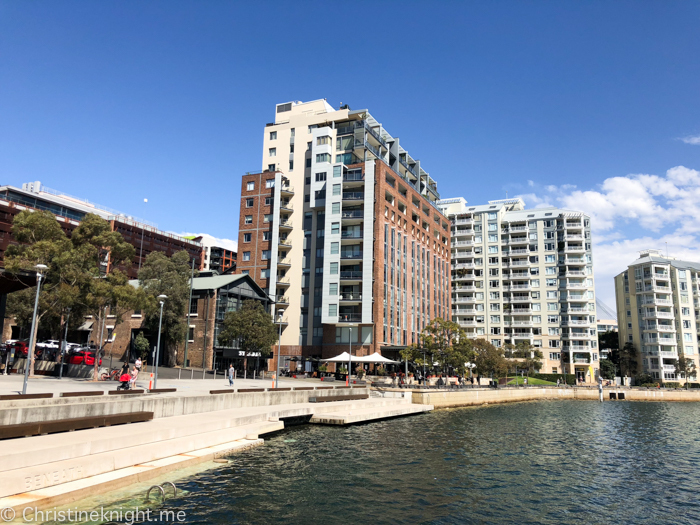 The former water police base was given a complete overhaul to create a space where inner city families could relax on the waterfront. 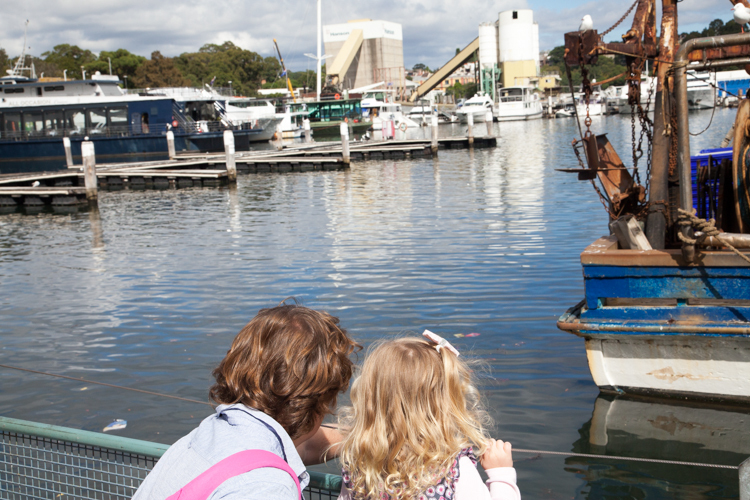 Watch out for the markers that designate the original shoreline on the esplanade. 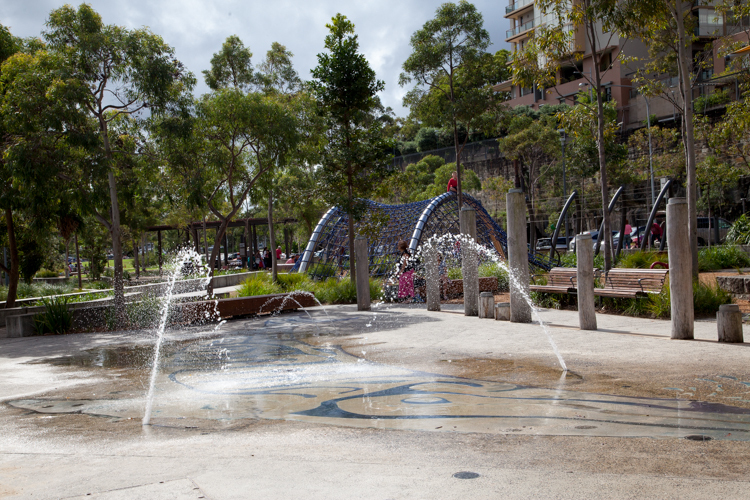 Pirrama means ‘rocking stone’ in the Gadigal language, with the name given to the park in tribute to the first Australians who lived in the area. 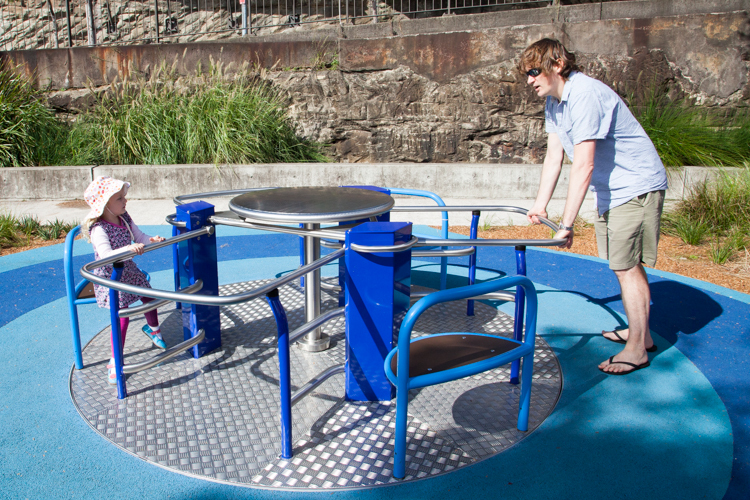 The Pirrama Park Playgound has plenty of excellent features including an accessible spinner that ensures kids of all abilities can enjoy the play equipment. 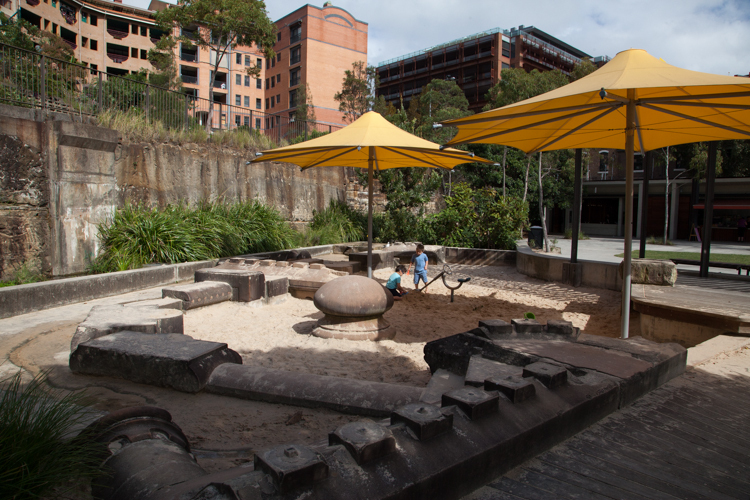 In the warmer months, water fountains spurt out of the ground in sporadic patterns, and a shade cloth over the sand pit gives kids a place to play without getting burned. 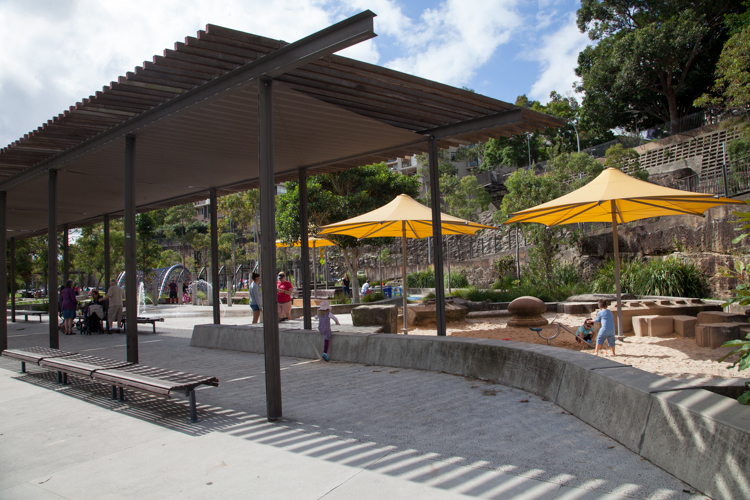 Undercover barbecues mean the park is great place for picnics and birthday parties, too. 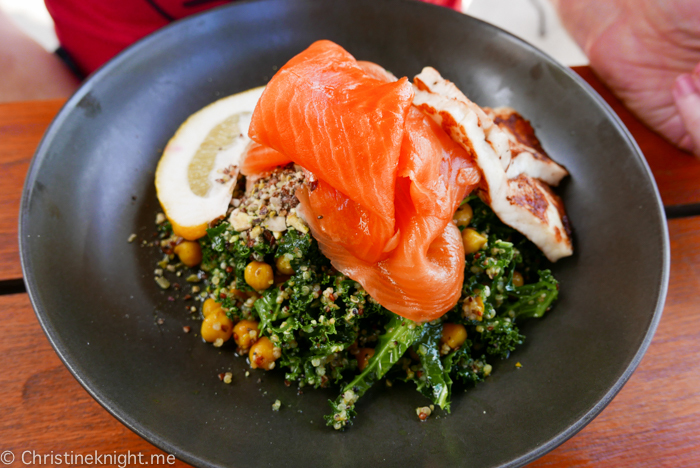 Modern, well-maintained bathrooms (including baby change facilities inside a disabled toilet) are a welcome addition to the park, and lunch is taken care of with the excellent Call Me Harris cafe. The open-air cafe features plenty of shaded seating. Read more about Call Me Harris cafe here. 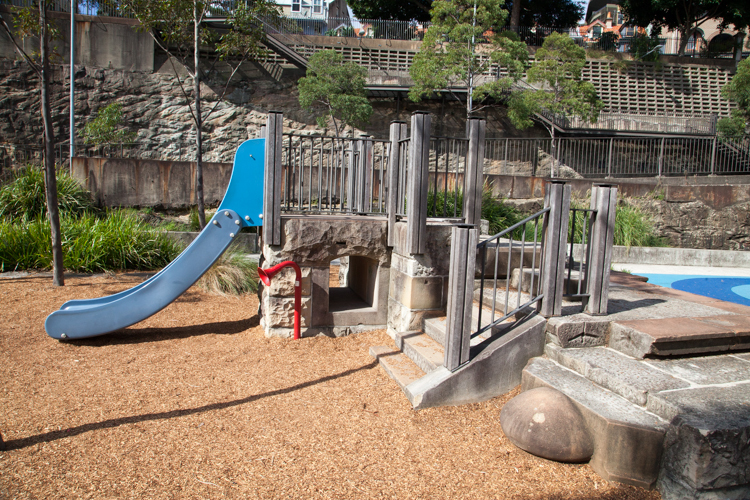 Pirrama Park is located at the end of Harris Street Pyrmont. There is metered parking available on the streets, or you can catch the 389 bus. 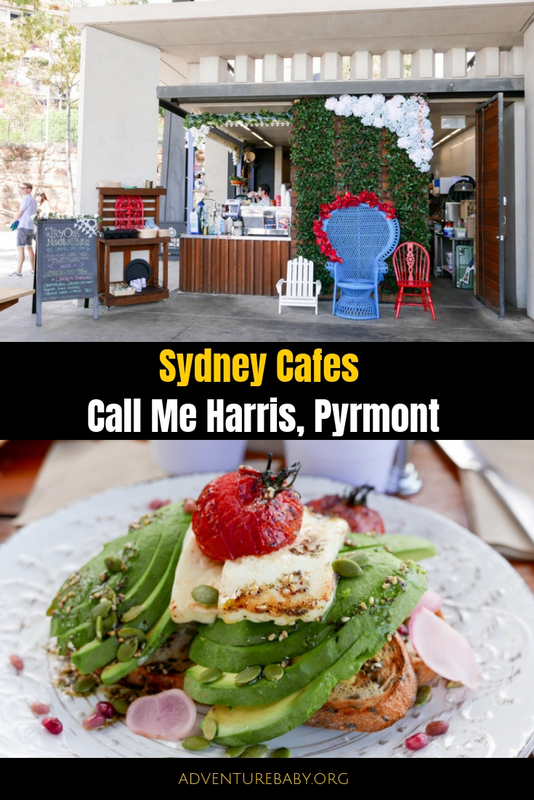 Located on at the end of Harris Street, Pyrmont, Call Me Harris offers beautiful water views along with fresh baked foods, all day brekkie and a great range of healthy meal choices. 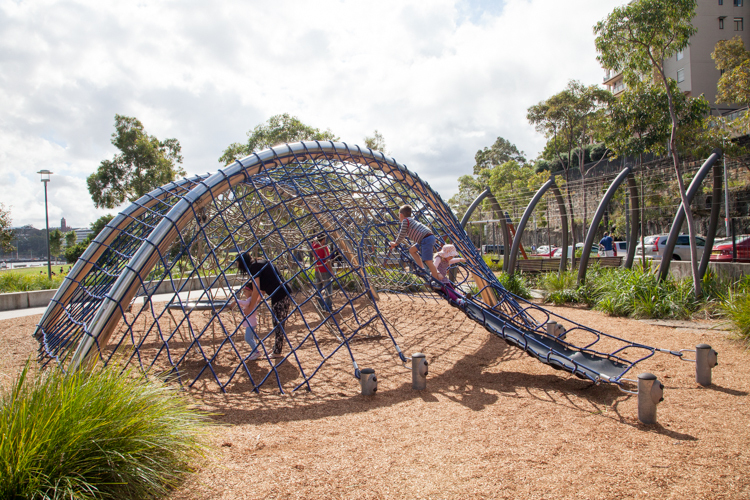 Sitting next to Pirrama Park and Pirrama Playground, it’s a great location for families to drop by to stave off the hangar attack or to get a much needed caffeine hit. With coffee by Three Pence Roasters, Call Me Harris has a reputation for serving excellent coffee. 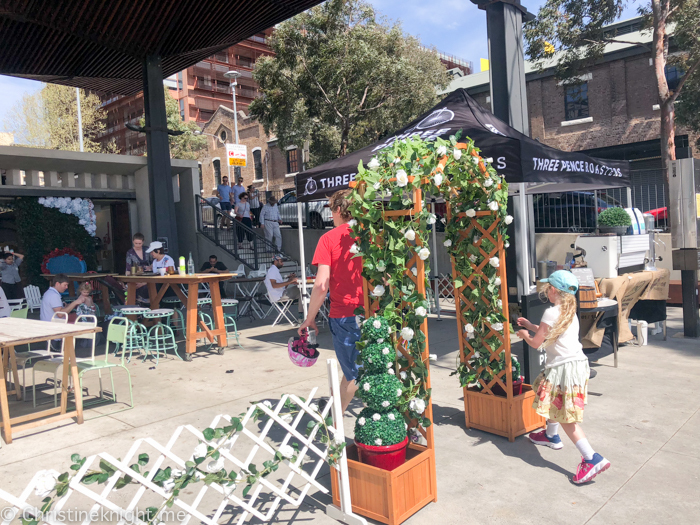 The open air cafe is casual and fun. Choose a seat and order at the counter, and be sure to take a selfie in the blue throne chair when you do. 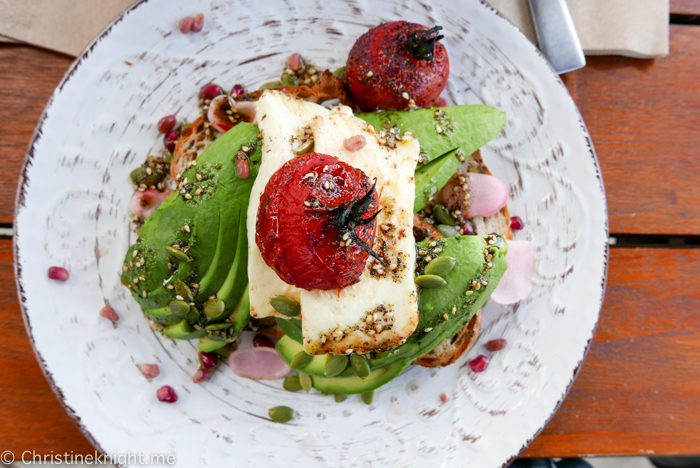 We love the all-day brekkie menu, choosing the Smashed Avocado and Sumac Tomatoes ($18) and Poke Salad, made with chicken or salmon ($18) as our meals of choice. 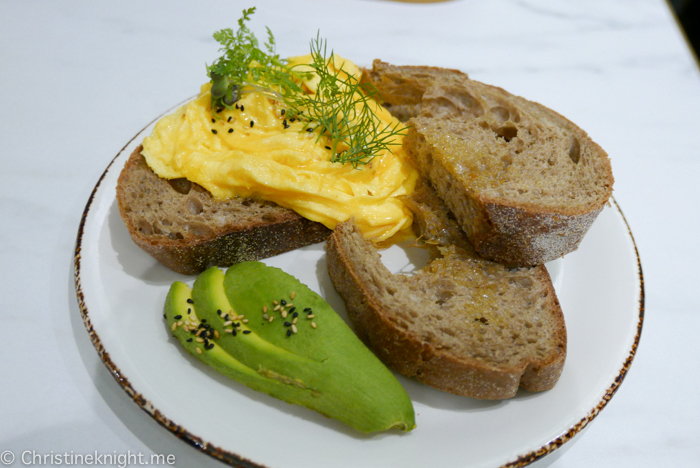 There is a kids’ lunch menu but not breakfast, but a Eggs and Bacon on sourdough dish ($14) does the job, substituting the bacon for a hash brown. 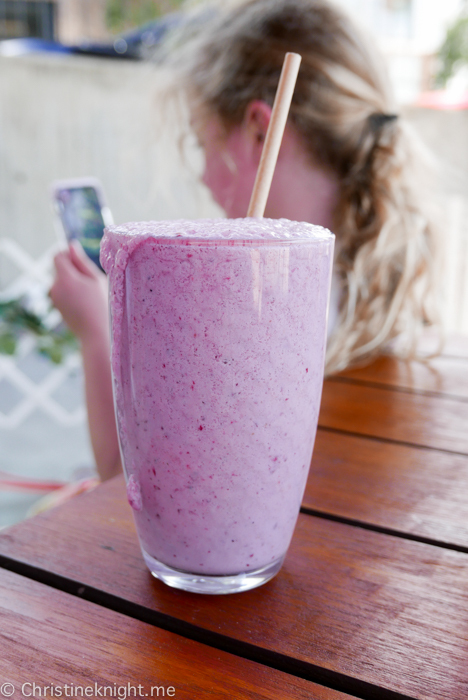 We also choose a Fruit Tingle smoothie, which is made from mixed berries and pineapple juice. 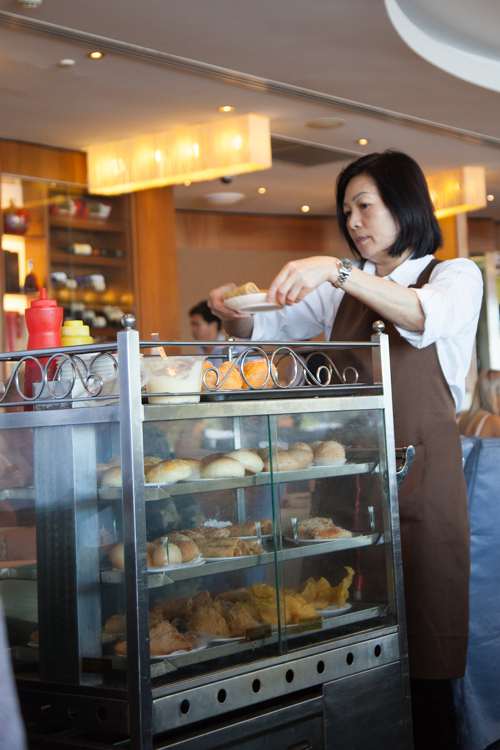 If baked goods are you thing then you will love the fluffy and fresh treats made daily on site. Cruffins are a regular feature, as are red velvet croissants. 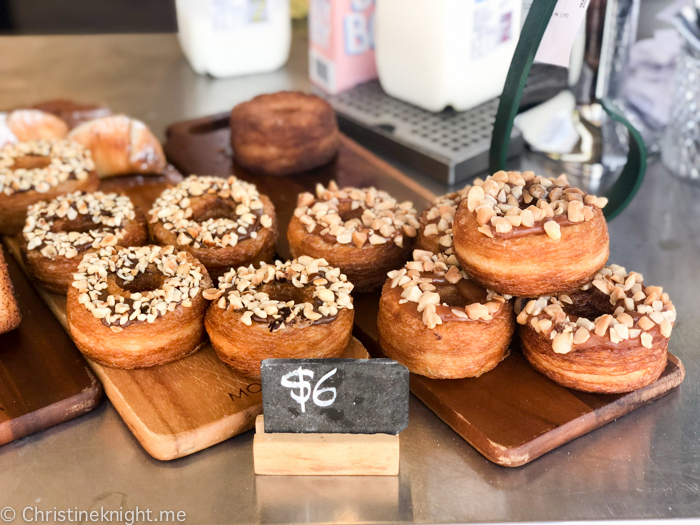 Today however, these cronuts are on offer and they look delicious. 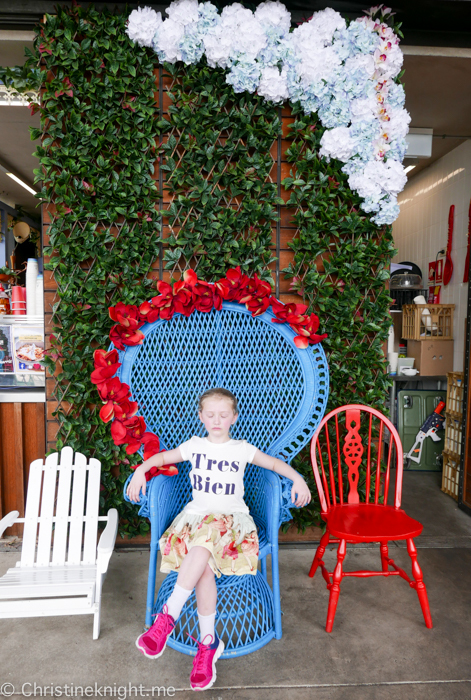 Kids will love the child-sized tables and chairs that are scattered around. 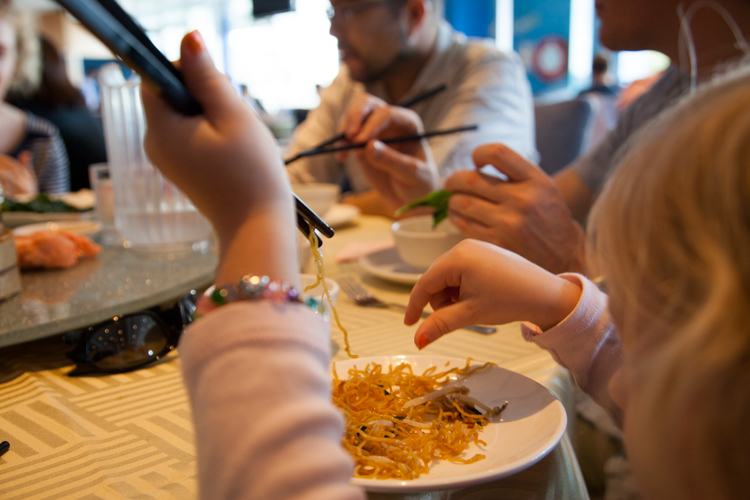 Adults will love the cheerful ambiance, excellent food and friendly staff. Public bathrooms are around the back of the kitchen, including a disabled toilet and baby change table. Read more about Pirrama Park and Playground here. 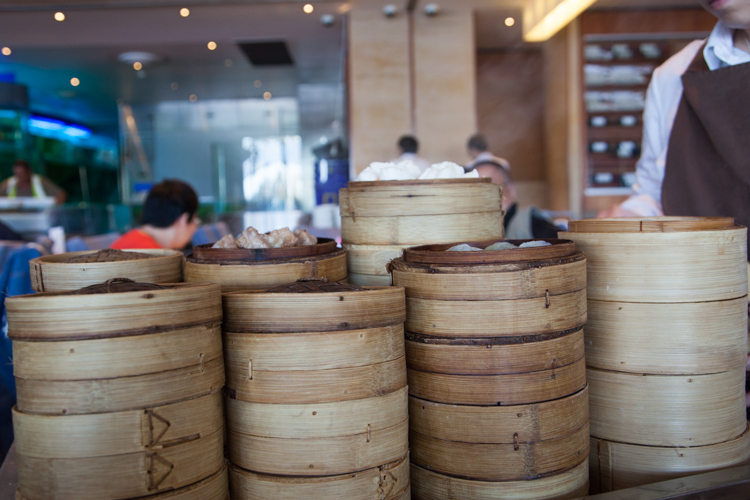 I know pretty much nothing about yum cha, except it’s food on carts that you choose when the servers come hurtling past. 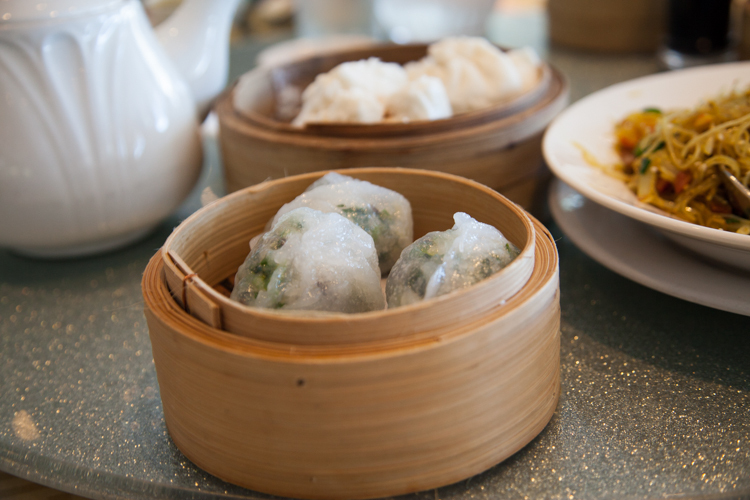 It turns out that “yum cha” is actually the Cantonese term for “drinking tea” and refers to the custom of eating tiny servings of different foods while sipping well-brewed Chinese tea. 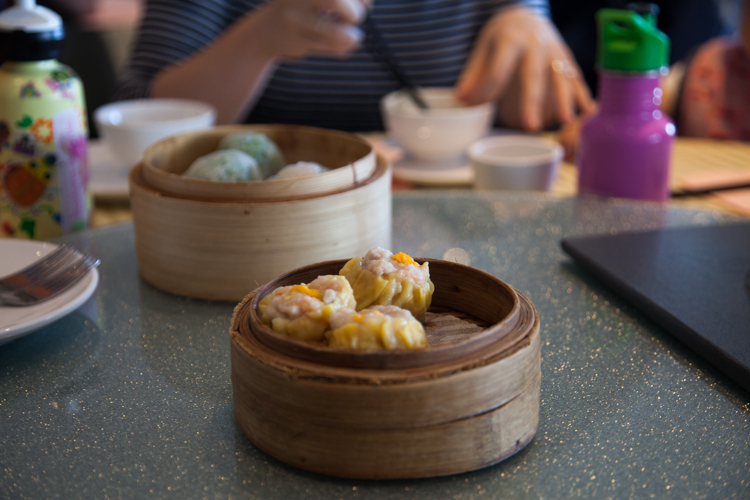 Yum cha fun for those who like a visual of their food before they order it, and also if you like to try lots of different bits and pieces for your meal. 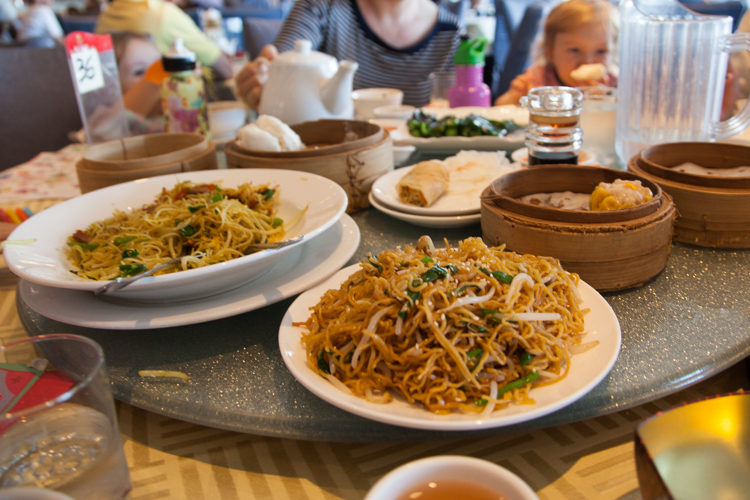 Yum cha is also an extremely good meal option if you have kids, which is how we found ourselves trying yum cha at Fisherman’s Wharf Seafood Restaurant, Pyrmont. We had a booking for 11am, which was lucky as even though it is a huge restaurant, it was absolutely packed at 11am (it opens at 10:30, which is when I took the photo as we were a bit early). 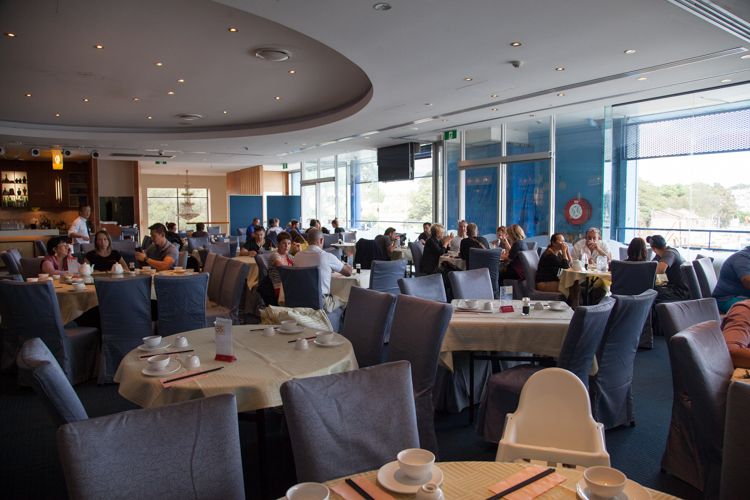 The staff were efficient and friendly, showing us straight to our table and setting up the high chair immediately. 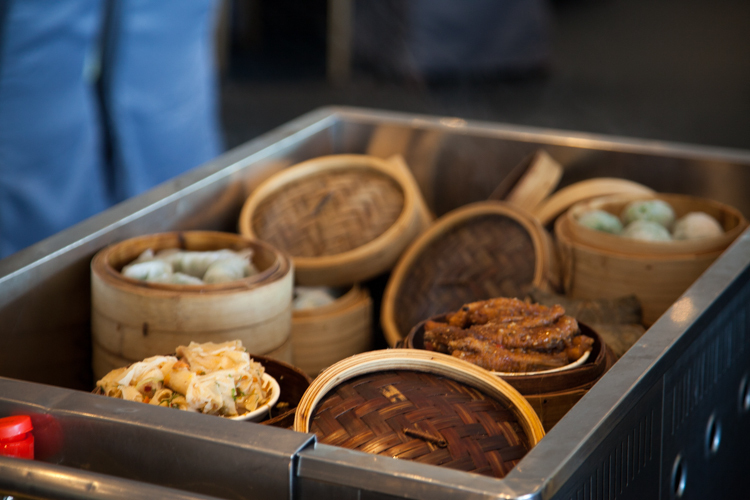 Food started flying past on carts immediately, and our friends who yum cha more than we do did the choosing, and also helped me track down some vegetarian dishes. 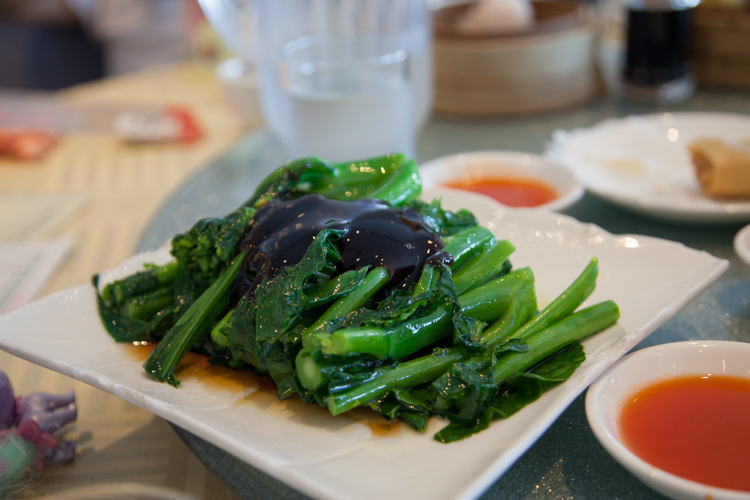 I managed to find vegetarian spring rolls, dumplings and soy noodles, plus some kind of greens dish. 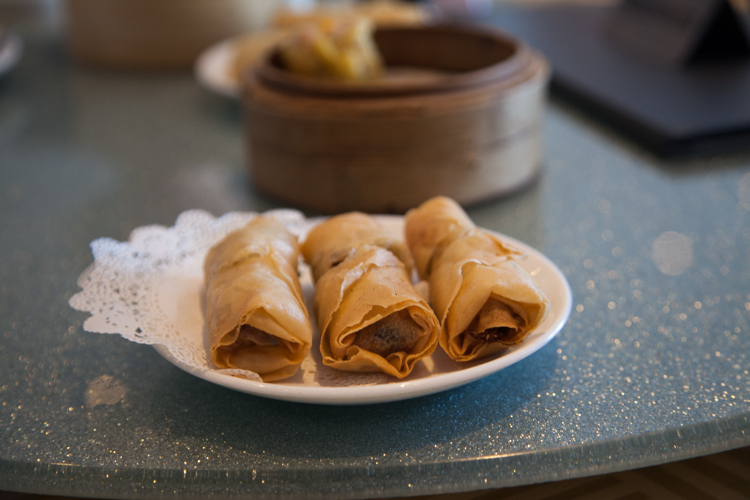 Cheese hadn’t been to yum cha before, but surprised us by trying a few things. 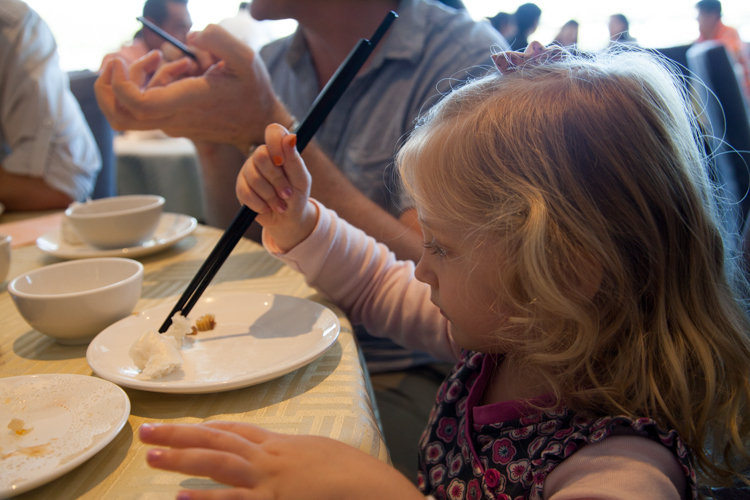 She was mostly keen to master chop sticks, and she had a pretty good try, managing to get food into her mouth using them. 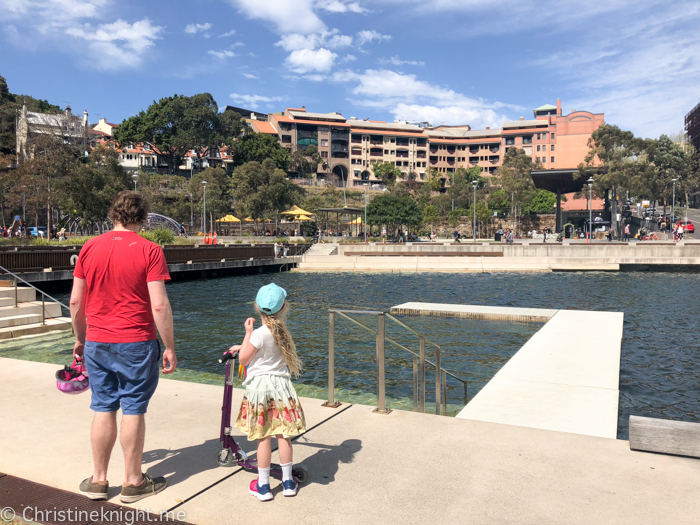 When the kids got antsy, they went for a walk to the big fish tank where all the fishies and crabs who are going to be cooked later are kept alive and swimming. The kids thought they were super cool, so that was a good distraction while we ate a bit more food. 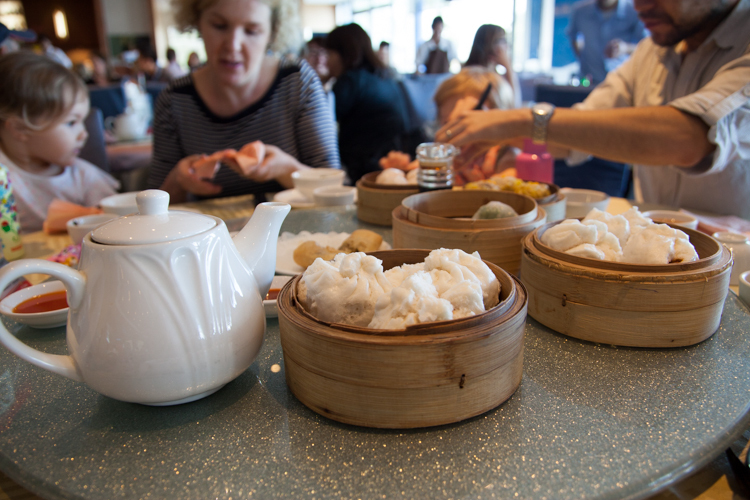 Yum cha is a pretty messy meal, so there is no pressure to have a neat table afterwards. It’s also a fast meal, which I always appreciate with a wiggly kid. We were in and out in about an hour, which is about the amount of time we can dine before Cheese gets bored and wants to do something else, so that was perfect. Cost-wise, the bill came to $110 for four adults, with the three kids kind of pecking at a few things, but not ordering anything specific just for them. 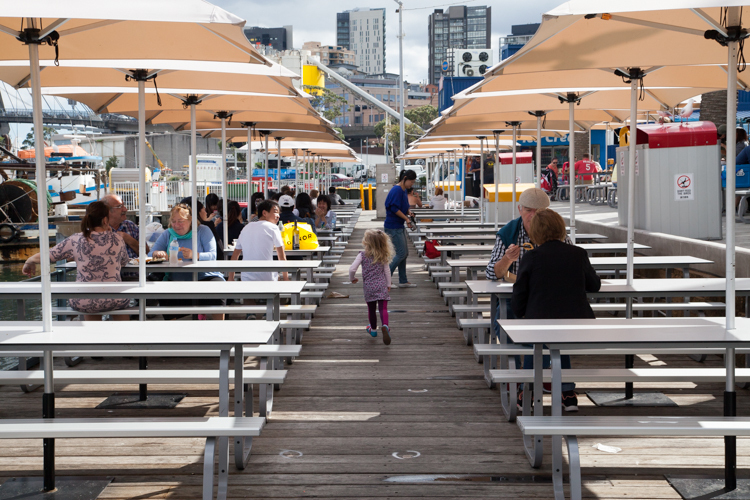 The restaurant is level one of a building at the Fisherman’s Wharf in the Sydney Fish Markets, and after we dined, we had a stroll down on the wharf to let the kids burn a bit of energy. 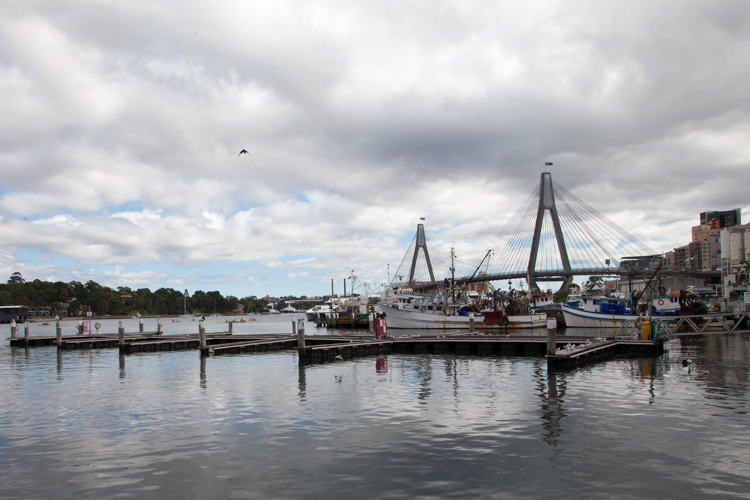 They enjoyed chasing seagulls and spotting pelicans, and us adults enjoyed walking off the food in the sun. What a view!